Painting a linoleum floor gives a room a new look. You need sandpaper, a deglossing agent, primer, a vacuum, a rag, porch and floor paint, paint brushes, paint pans and rollers, painter's tape and a stencil. Use sandpaper, a vacuum, a rag and a deglossing agent to prep your linoleum floor. 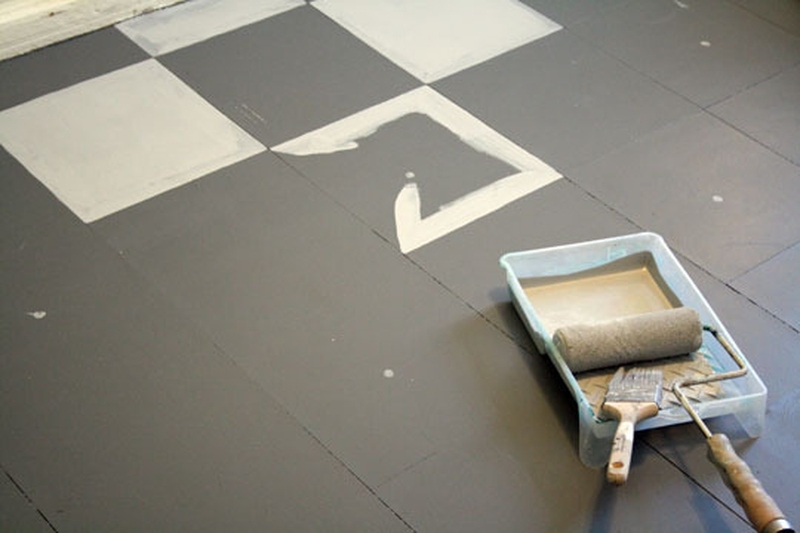 Use primer, porch and floor paint, paint pans and rollers, paint brushes, painter's tape and a stencil to paint the floor. Sand the floor with sandpaper to remove the glossy layer from the linoleum. Vacuum the floor to remove dust. Use a deglossing agent like Gloss-Off to remove any gloss that remains. Use a rag, and follow the instructions on the bottle. Wait for at least 10 minutes before moving to the next step. Apply a layer of paint primer to the entire floor with a brush or roller. Cover the floor with a thick enough coat to give it a smooth surface. Allow the primer to dry, sand it, and apply a second coat. Allow the second coat of primer to dry completely. Paint the floor with porch and floor paint and a roller. Use a paint brush to get into corners and cut in along walls. Allow the paint to dry. Apply a second coat if necessary, and allow the paint to dry. Add a stencil design to the floor if you wish. Hold or tape the stencil down, and apply paint with a paint brush. Allow the design to dry before you move furniture back into the room or walk on the floor. Server responsed at: 04/24/2019 4:25 p.m.